When I watch classic movies I often watch them differently than contemporary films. With classic films I can get sucked in just by the vintage fashions and sometimes the real world film locations. That's the case with Perfect Strangers (1950), a court room drama starring Dennis Morgan and Ginger Rogers. The film is a day in the life of Los Angeles jurors forced to live together during a trial. Morgan plays a married man who falls in love with another juror, a woman separated from her husband, played by Rogers. The story is interesting for its look into the juror process circa 1950, but the drama is a bit lackluster. What really won me over was the fantastic Los Angeles film locations and also that the film features some of my favorite actors. 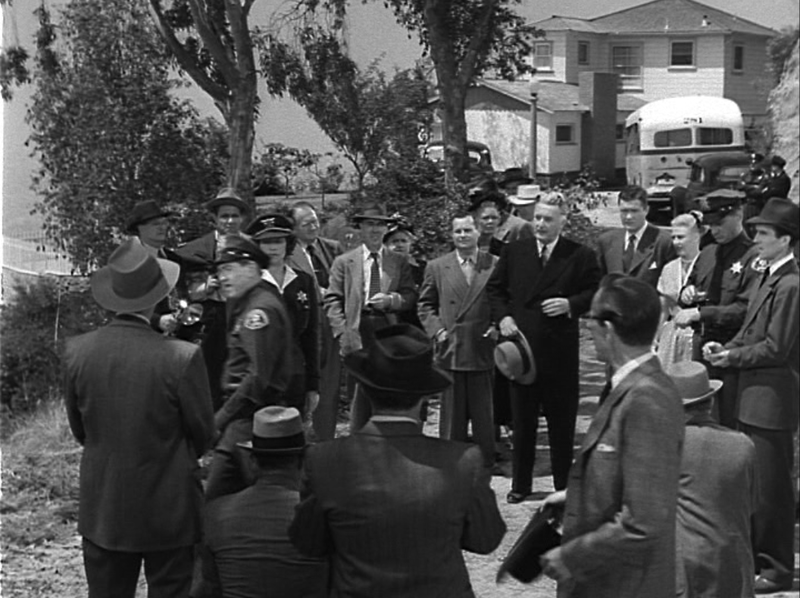 In addition to Morgan and Rogers, the film also features, Thelma Ritter, Paul Ford, Alan Reed (the voice of Fred Flintstone), and other recognizable character actors. 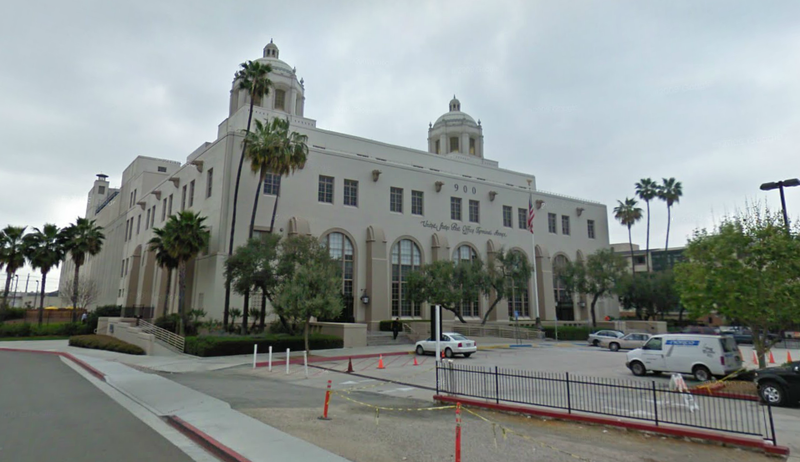 Here are some of the Los Angeles filming locations that appear in Perfect Strangers. The film begins with a scene of Los Angeles residents being selected at random for jury service and the notices being processed for delivery at the United States Post Office Terminal Annex located at 900 North Alameda Street, in downtown Los Angeles. 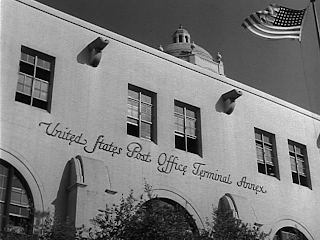 In the comparison above is a screenshot of the Terminal Annex as seen in the film and an image of how the historic post office building appears today. 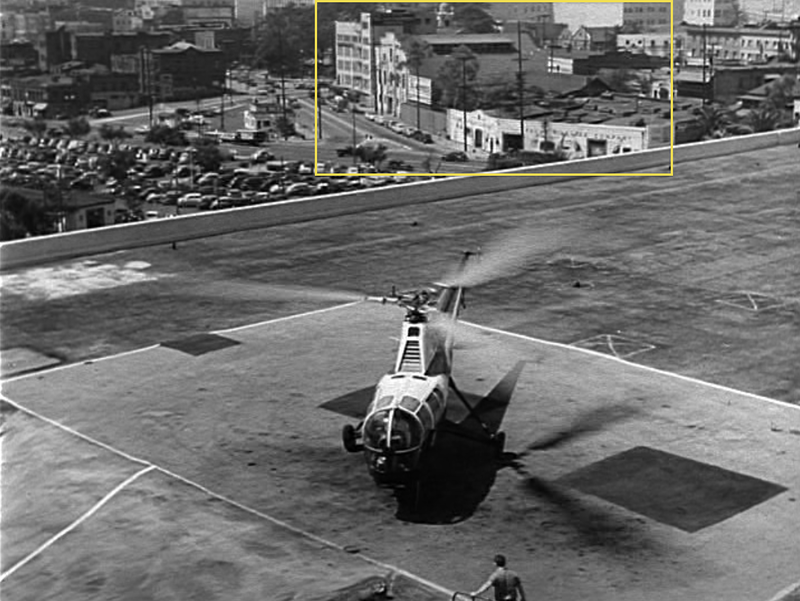 In the comparison below, we see a helicopter take off from the roof of the Terminal Annex. In the background, we get a glimpse of Olvera Street, the oldest part of downtown Los Angeles. 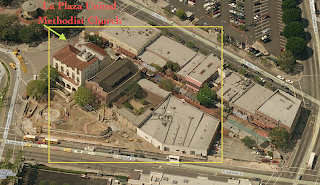 One of the structures that can bee seen and is still standing is La Plaza United Methodist Church, which stands at the entrance to Olvera Street. See inside the yellow rectangle. Terminal Annex rooftop. Olvera Street can be seen inside the yellow rectangle. Bird's Eye View of Olvera Street as it appears today. In the next comparison the helicopter takes off from the Terminal Annex rooftop and we see, from left to right, Los Angeles City Hall, the United States Courthouse building, and the historic Hall of Justice building. From left to right: City Hall, Courthouse, Hall of Justice buildings. A view of the three buildings as they appear now. One of the people called for jury service is Ginger Rogers. 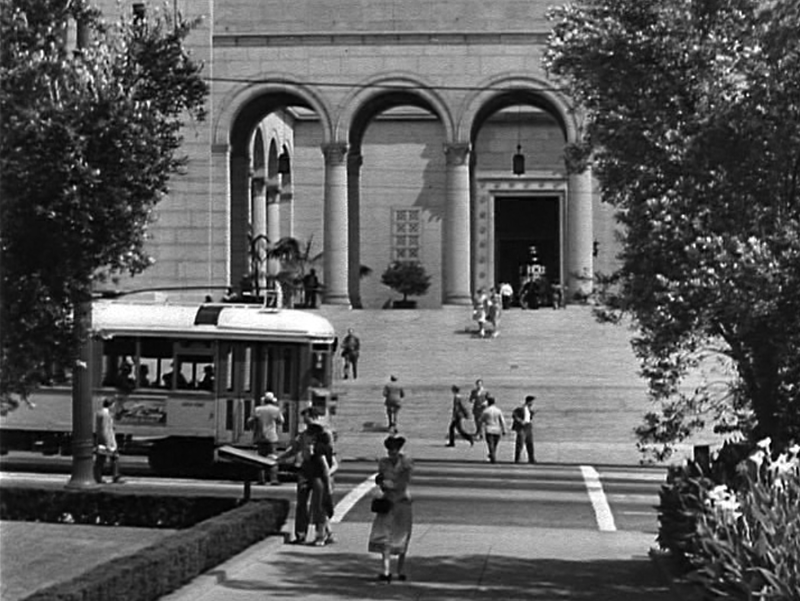 In the scene below, Ginger Rogers arrives via trolley in front of Los Angeles City Hall, located at 200 north Spring Street. 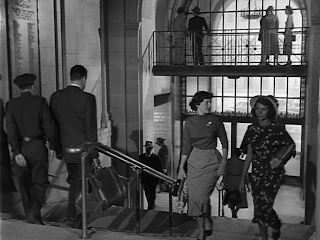 She gets off the trolley and walks across the street from City Hall towards the Hall of Records building. 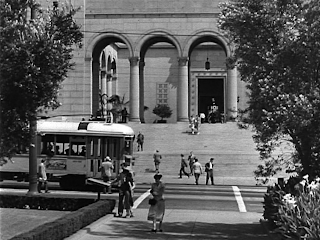 Ginger Rogers arrives by trolley in front of City Hall. 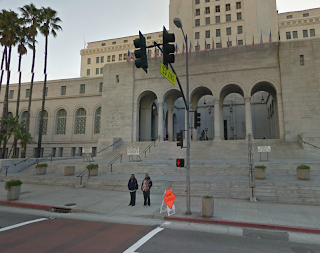 Los Angeles City Hall, 200 N. Spring Street. 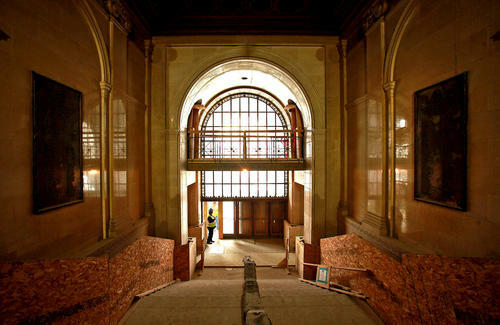 Below we see Rogers walking towards the Hall of Records building located directly across from City Hall. 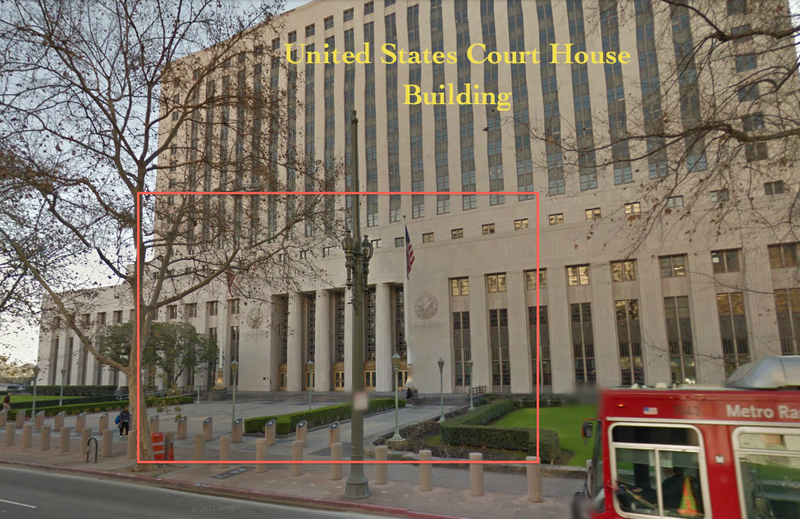 After Rogers arrives at the Hall of Records building she then walks next door to the Hall of Justice building. The Hall of Records was a 12-story building constructed between 1909 and 1911 and then demolished in 1973. The Hall of Justice building, which was damaged in the 1994 Northridge earthquake, has been closed ever since the quake, but is still standing and undergoing a 231 million dollar renovation. 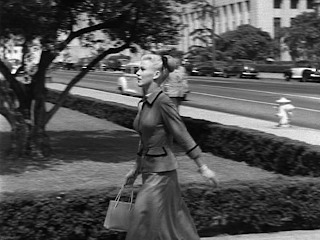 Rogers walks towards the LA Hall of Records building. A photo from 1954 looking down Spring Street showing the Hall of Records, Hall of Justice, and on the right, the United States Courthouse and City Hall buildings. 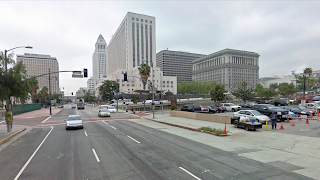 Looking down Spring Street in front of City Hall as it appears today. 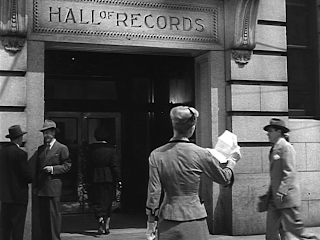 Rogers first arrives at the Hall of Records building. 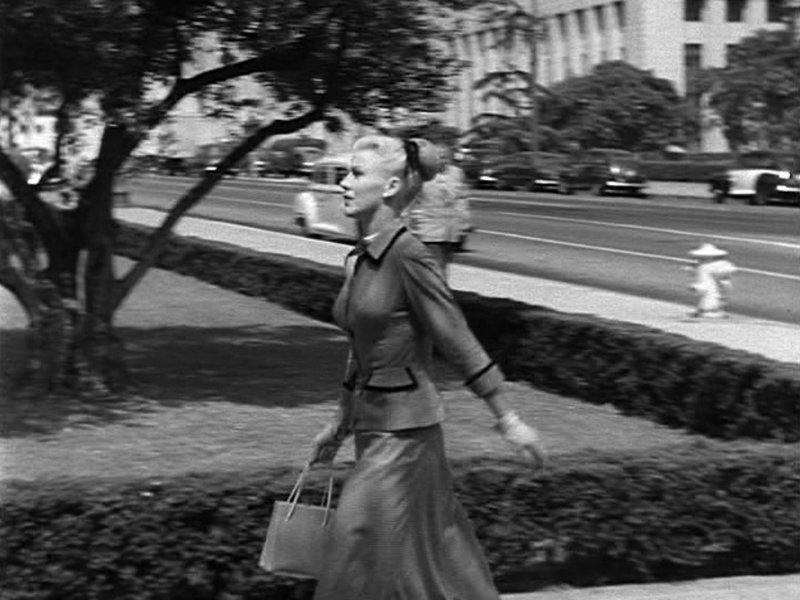 After Rogers arrives at the Hall of Records building, she then heads over to the Hall of Justice building next door. 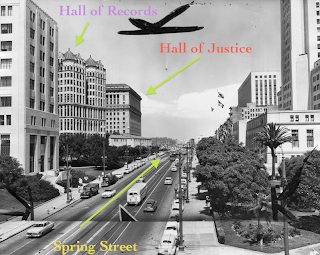 Below is a historic photo from 1947, three years before the film, showing how the Hall of Justice building appeared at the time. The building stands at the corner of Temple Street and Spring Street. 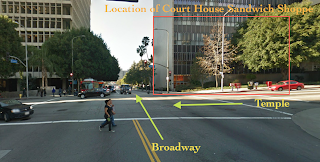 The yellow circle next to the green arrow marks where Rogers can be seen walking up the sidewalk. 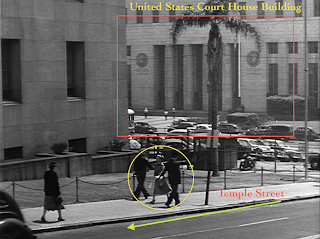 In the second and third images, the red rectangle marks where the United States Court House building can be seen in the background. 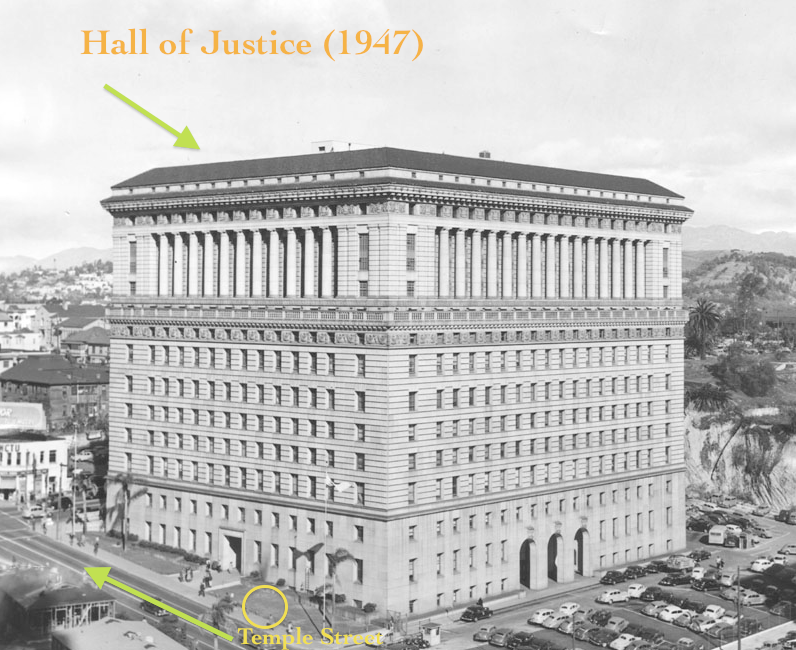 A 1947 photo of the Hall of Justice. 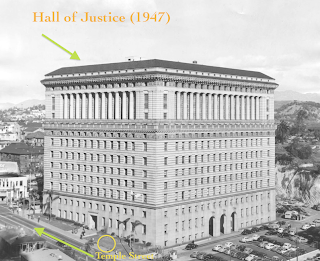 The yellow circle shows Rogers in front of the Hall of Justice. Looking down Temple Street in front of the Hall of Justice. 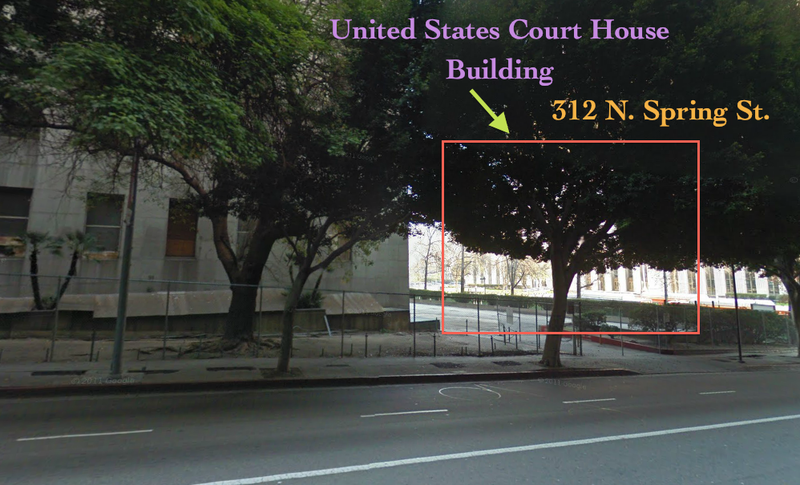 The red rectangle marks where the United States Court House building is located (hidden behind the trees). 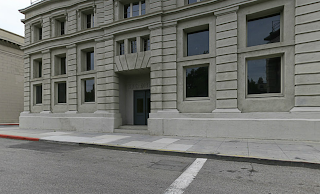 United States Court House building. 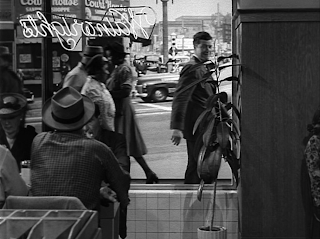 In the next scene, Morgan can be seen leaving a restaurant after dining with fellow juror, Rogers. The restaurant where Morgan and Rogers eat was clearly a fake created on a sound stage, but in the background of the screenshot below, we see a restaurant called the Court House Sandwich Shoppe. This was a real restaurant located on the corner of Broadway and Temple, near the Hall of Records building. 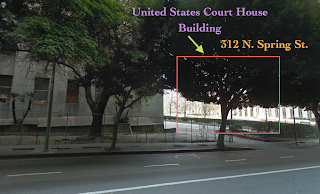 Like the Hall of Records building which was demolished in 1973, the Court House Sandwich Shoppe building has also been demolished. Morgan at the corner of Broadway and Temple. The Court House restaurant can be seen in the background. 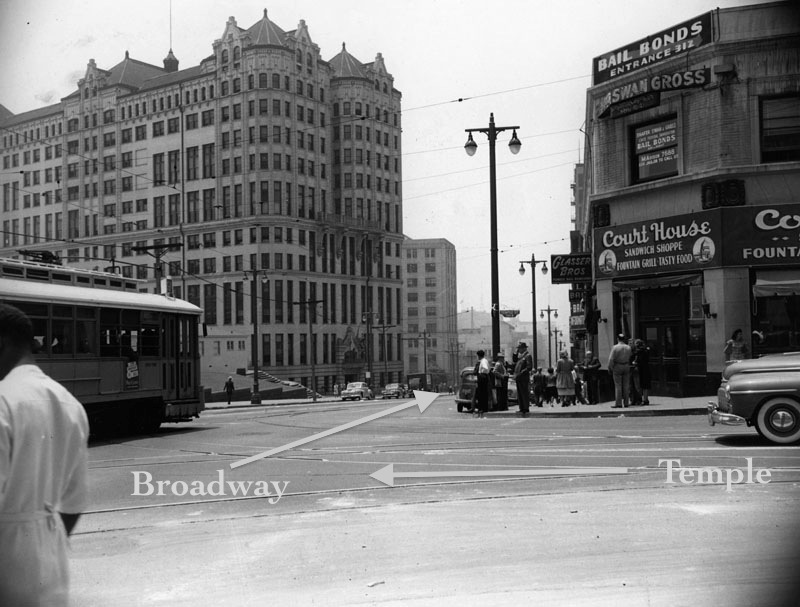 A photo from 1954 shows the Court House Sandwich Shoppe. 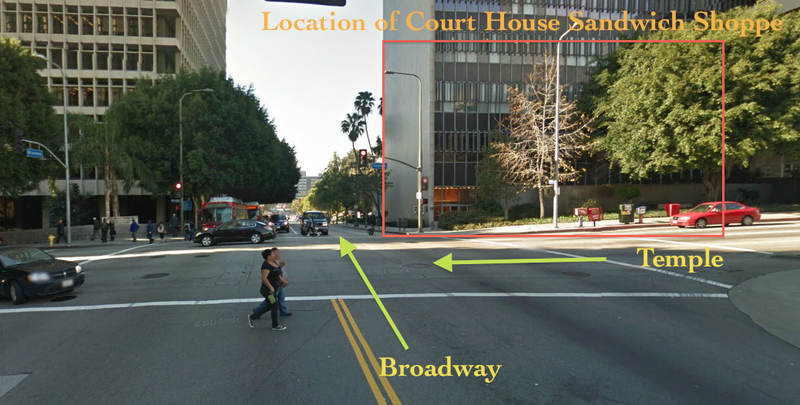 The red rectangle marks the site of the Court House restaurant. 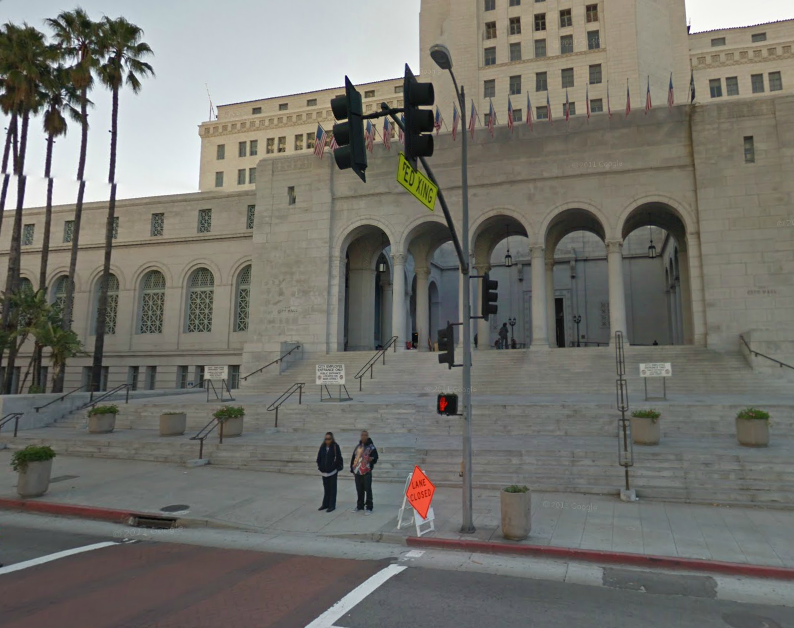 All the jurors are housed in what is supposed to be a downtown Los Angeles hotel with a view looking over City Hall and the Court House; however, I'm not 100% on this one, but I'm pretty sure that the hotel was really a facade located on the Warner Bros. Studio New York Street backlot in Burbank. Below is a screenshot of the jurors arriving at the hotel and an image of the facade I believe to be used as the location of the hotel. The signage, lamps and other details on these facades are changed all the time, but the skeleton of the building looks like it could be a match - plus, the fact that this is a Warner Bros. film, makes it likely that they could have used this facade. The jurors arrive via bus at what is supposed to be a downtown hotel. 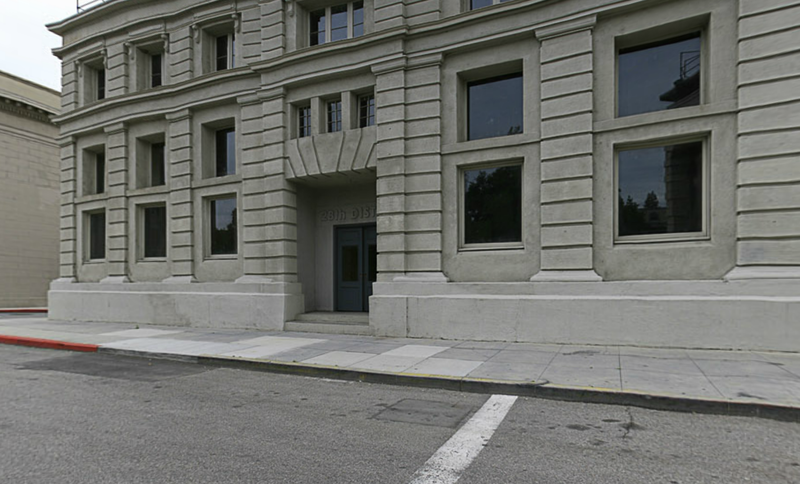 A Warner Bros. backlot facade I believe to be the real location. 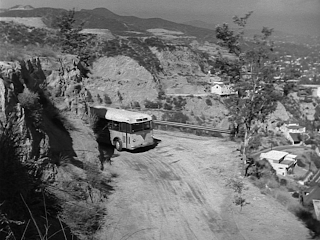 During the trial, the jurors are taken by bus to the scene of the murder. 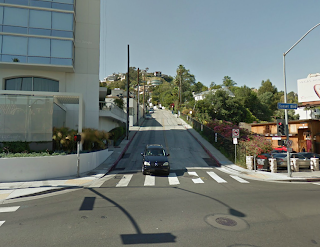 I assumed that the bus was going down Sunset Boulevard along the Hollywood Hills, I just needed to find the right cross street, which I did when I came to Kings Road. 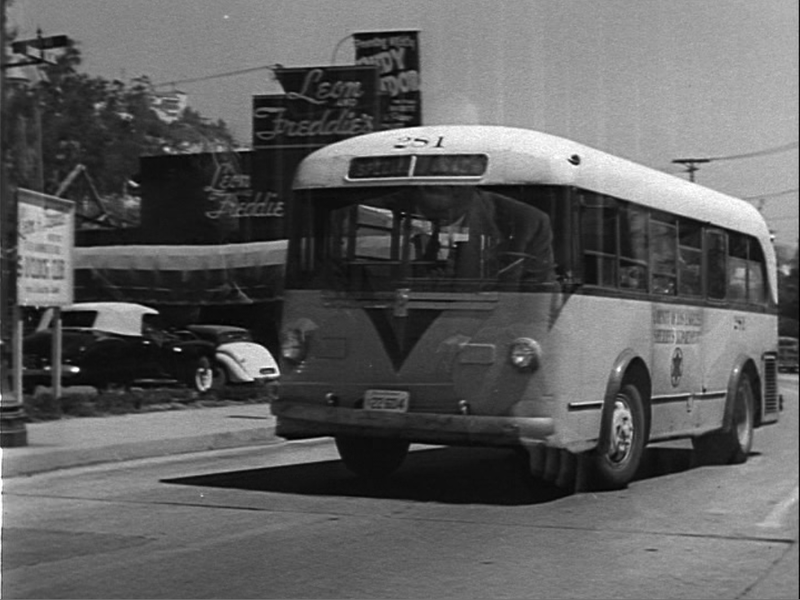 In the scene below, the bus passes a restaurant called Leon and Freddie's, located at the corner of Sunset Boulevard and Kings Road, where the popular Saddle Ranch bar is now located. The bus takes the jurors down Sunset Blvd at Kings Rd. 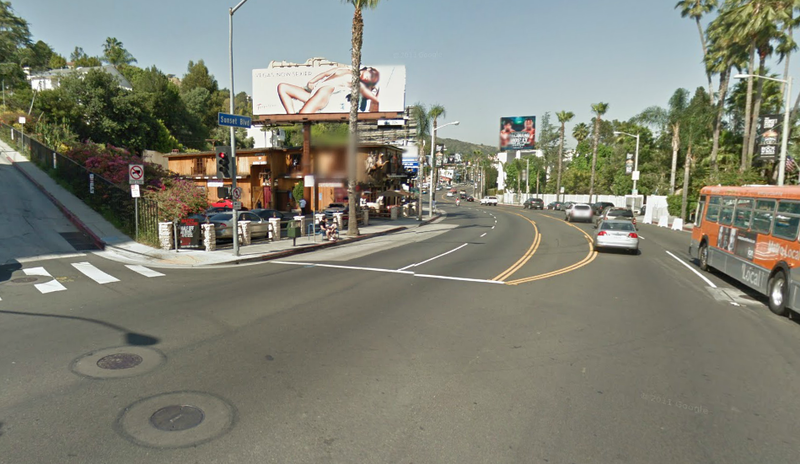 The corner of Sunset Blvd. and Kings Rd. The "murder" took place near the cliff side of a Hollywood Hills home. This was the most interesting part of the film for me. The hills look so different today. Where at the time of the film there was mostly open land, there are now so many homes dotting the hills. 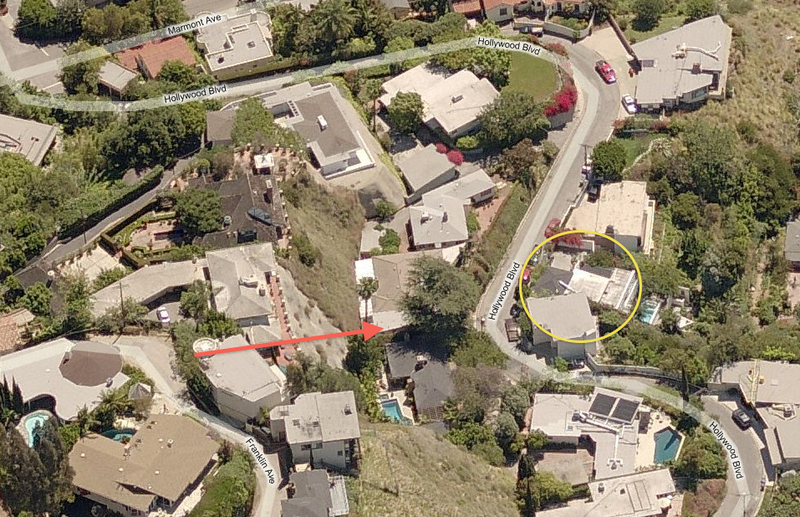 After combing the hills with a few different aerial views I was finally able to pinpoint the location of the home that was used for filming. 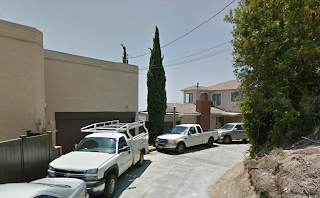 The home is located at 8412 Franklin Avenue, West Hollywood. The bus heads up Kings Road to the scene of the crime. Looking up Kings Road in West Hollywood. The Hollywood Hills home sits on a cliff on Franklin Ave. The yellow oval marks the home as seen from Kings Road. 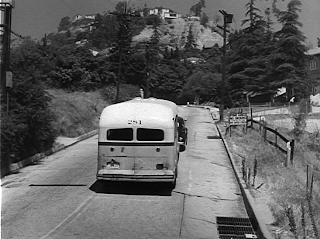 The bus winds up Franklin Avenue in the Hollywood Hills. 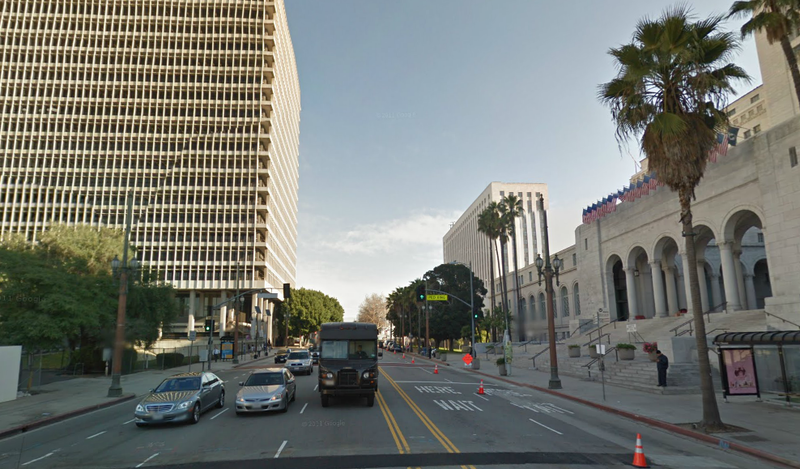 The same view from Franklin Ave as it appears today. Below the jurors get to see a reenactment of what might have been the way things played out the night of the crime. Behind them is the house that is located on Franklin Avenue up in the hills. Just below that is an image showing the home as it appears today. 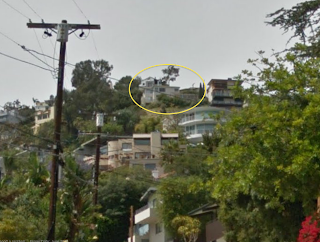 I was actually quite shocked when I found the home to see that it hadn't been demolished and replaced by some modern Hollywood Hills mansion. 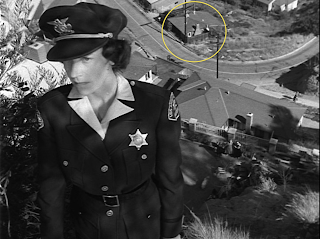 After I found the home, I did some more digging and learned that the house was built in 1944, six years prior to this film. 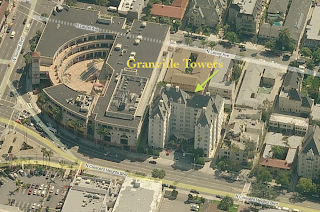 While the jurors are at the crime scene walking around we get views of some landmark buildings as seen from the Hollywood Hills, including the Sunset Tower Hotel and the Granville Towers apartment building. The jurors see a reenactment in front of the Franklin Ave home. Over 65 years and the home is still standing. An eternity by LA standards. 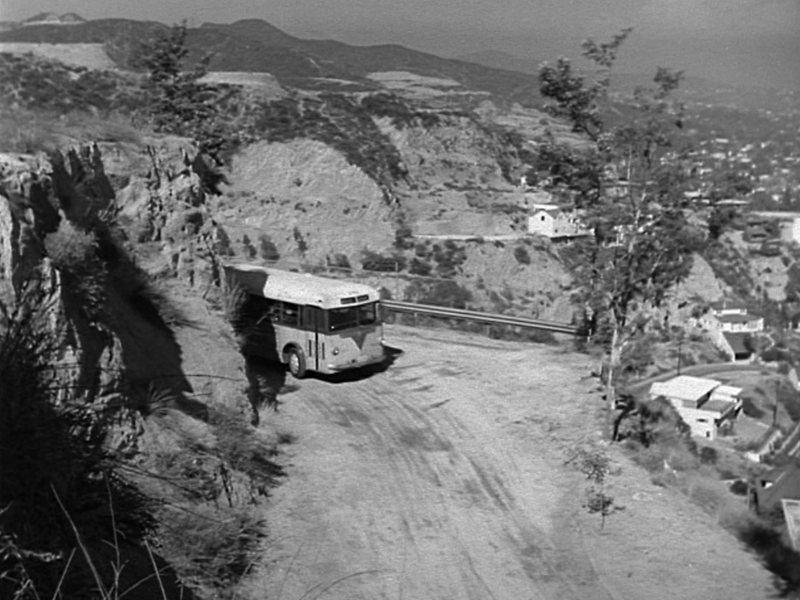 Below, jurors take in the view from the Hollywood Hills. The art deco Sunset Tower Hotel can be seen in the background. The hotel has long been a residence for Hollywood celebrities, including John Wayne, Marilyn Monroe, Clark Gable, Errol Flynn, Paulette Goddard, Preston Sturges, Billie Burke, and Zsa Zsa Gabor. The Sunset Tower Hotel as seen in the film. 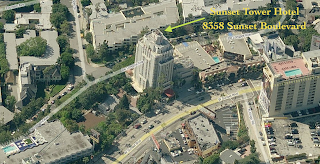 A Bird's Eye View of the Sunset Tower Hotel. 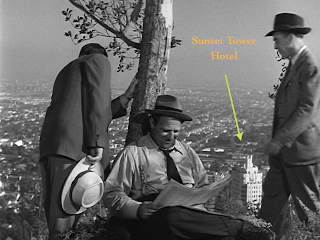 In another scene we get a view showing the Granville Towers, a posh West Hollywood apartment building built in 1930 by legendary architect, Leland Bryant. 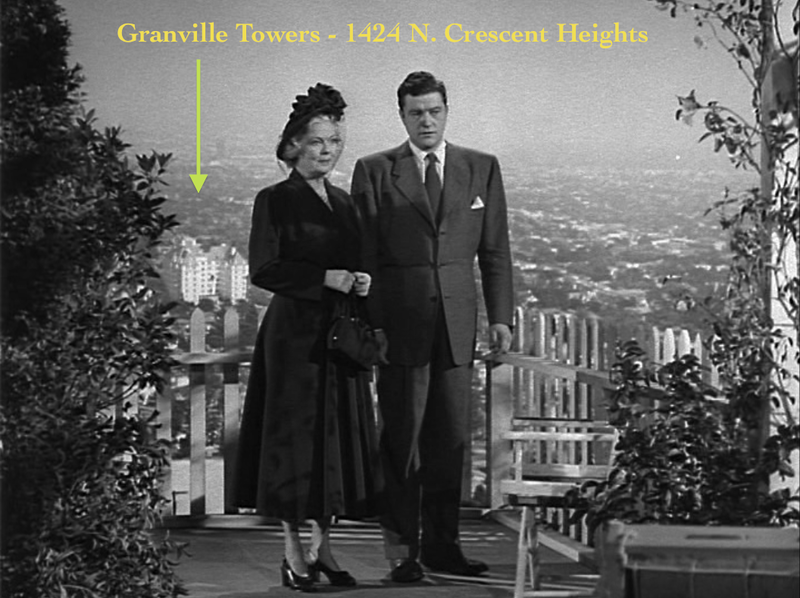 The Granville Towers has been the home to many notable celebrities, including Marilyn Monroe, Rock Hudson, and singer David Bowie. The Granville Towers as seen in Perfect Strangers. A Bird's Eye View of the Granville Towers. 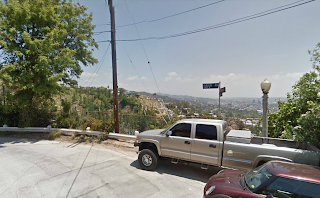 During the reenactment at the crime scene, we get this view looking down from Franklin Avenue in the Hollywood Hills towards the next street below, Hollywood Boulevard. Amazing enough, the homes located on Hollywood Boulevard at the time of the film still appear to be intact. Looking down from Franklin Ave toward Hollywood Blvd. Bird's Eye View of Franklin Ave. and Hollywood Blvd. 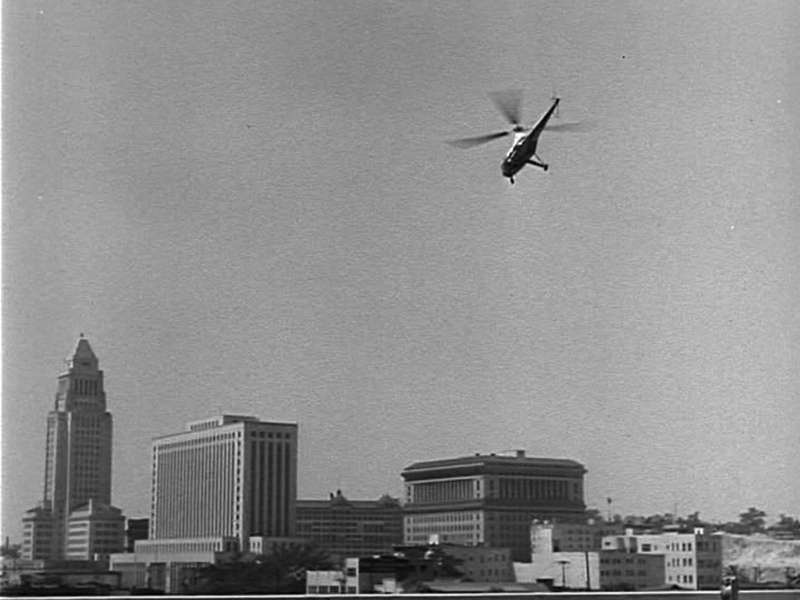 In one scene during the film we get a glimpse of a news ticker on the side of a building announcing an update to the trial. That news ticker was a big deal. According to a The Billboard magazine article from September 7, 1946, on a Tuesday night, August 6, 40,000 people showed up to see the premiere of that sign, the "Trans-Lux Flashcast news ribbon...brought to Los Angeles by Warner Bros. KFWB." 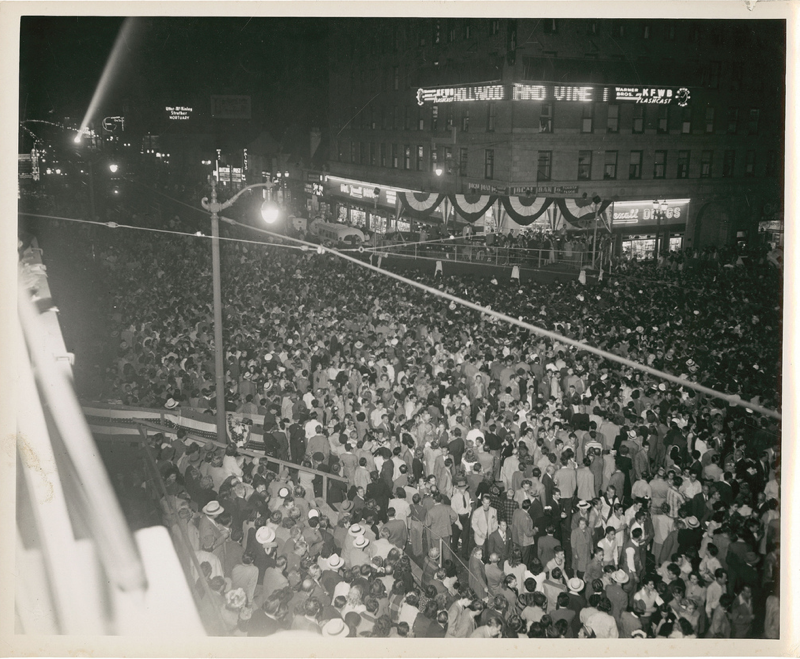 The news ribbon was located on the side of of the historic Taft building at the intersection of Hollywood and Vine, in Hollywood. The news ribbon as seen in Perfect Strangers. 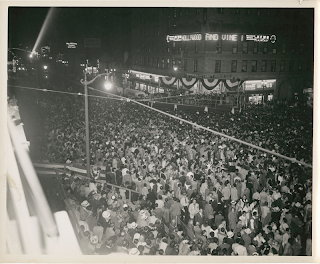 A crowd gathers under the news ribbon at Hollywood and Vine. Photo from the Flickr page of AliceJapan. 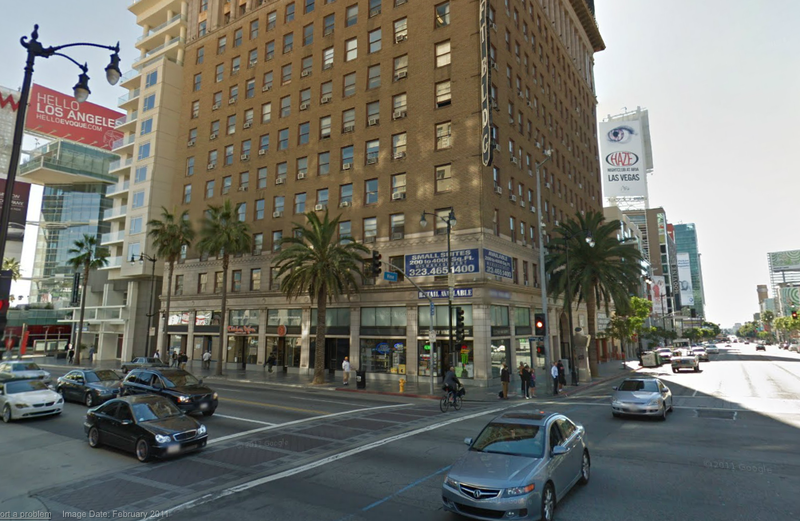 The Taft building in Hollywood. The news ribbon has been removed. 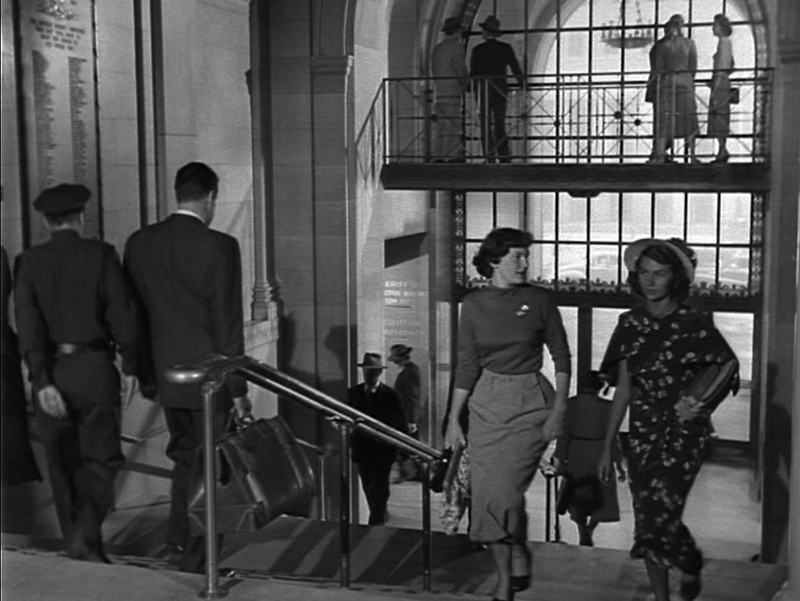 During the final scenes of the film we see the jurors leaving the Hall of Justice building back in downtown Los Angeles. 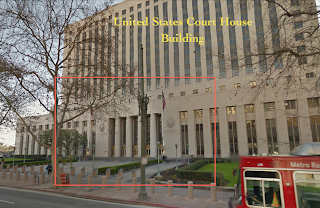 As I mentioned before, the Hall of Justice has been closed ever since the 1994 Northridge earthquake, this is a great glimpse inside of the historic building. 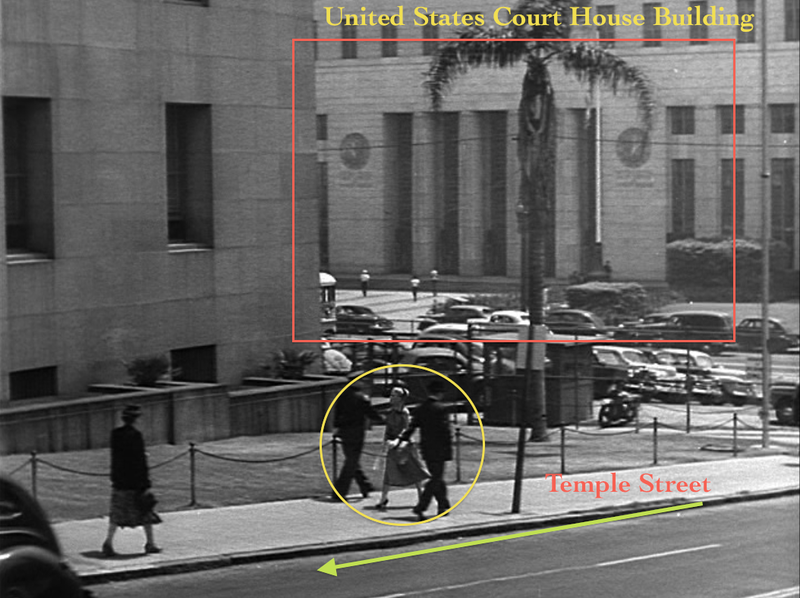 Below is a screenshot from the film showing Dennis Morgan exiting the Hall of Justice and a contemporary image showing how the same location appears today. 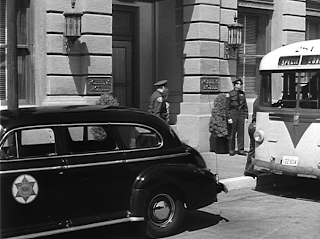 Dennis Morgan leaves the Hall of Justice. A contemporary view of the Hall of Justice. The interior of the Hall of Justice appears in another film I've blogged about, the 1978 film The Big Fix, starring Richard Dreyfuss. Perfect Strangers is currently available to rent through Classicflix and through the Warner Archive collection. 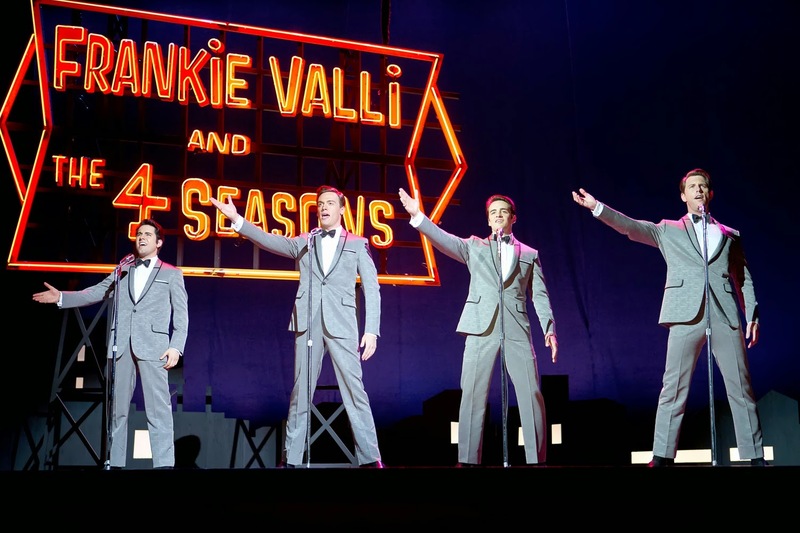 Jersey Boys, the hit Broadway musical about Frankie Vallie and the Four Seasons, is getting the cinema treatment. The film version, directed by Clint Eastwood and starring Christopher Walken and Vincent Piazza, hits theaters on June 20, and a new trailer was released today. 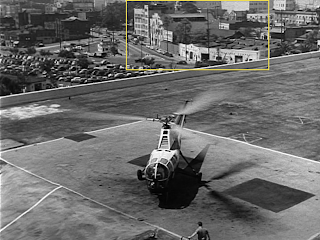 One thing I spotted immediately in the trailer was a scene that was clearly filmed on the Warner Bros. New York Street backlot set in Burbank, California. The below screenshot was taken from the trailer. As the movie has not yet been released, I don't know exactly what is taking place in the scene, but it looks like the band must be arriving to perform at a concert. Notice how with a little movie magic the film designers were able to change the background to appear differently from what the actual background looks like. If you go see this movie in theaters, keep your eyes open for this scene. A screenshot from Jersey Boys (2014). 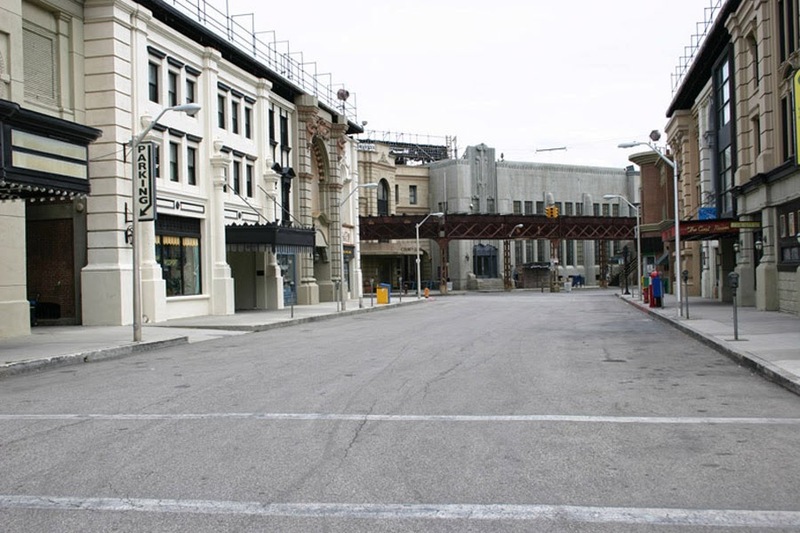 The Warner Bros. New York Street backlot set. 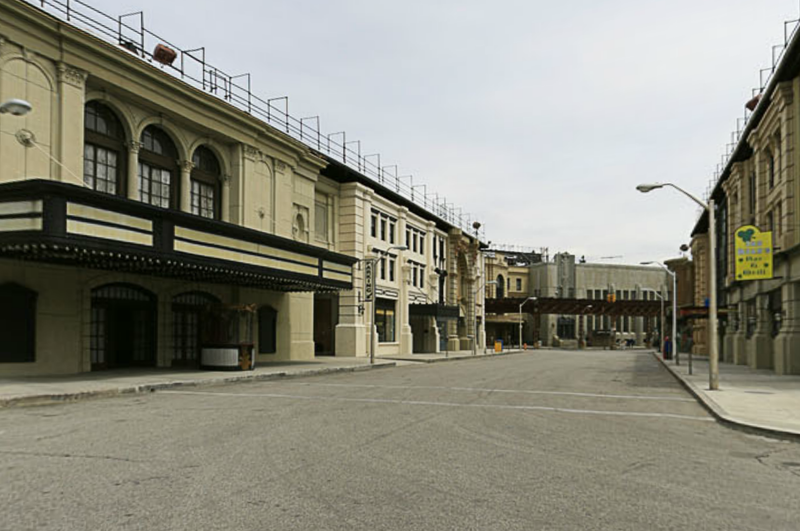 A wider view of the Warner Bros. New York Street backlot set. Below is the full trailer for Jersey Boys. I must admit, when I first heard that Clint Eastwood was directing a musical I was a bit skeptical, but the trailer looks interesting and I'm much more excited than I was before. Official Trailer for Jersey Boys (2014). So what do you think of this upcoming film? 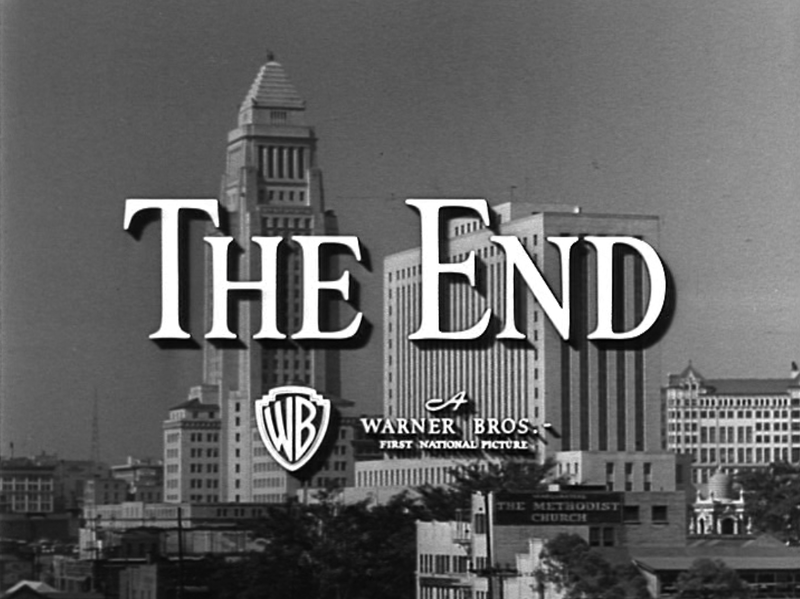 All images (c) Warner Bros.
Shemp Howard of The Three Stooges. 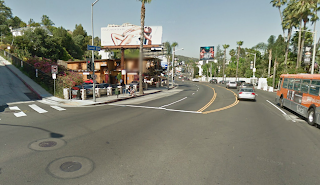 Toluca Lake, a tony neighborhood located partly in Burbank and Los Angeles in the San Fernando Valley, has long been a favorite place to live for Hollywood celebrities, including Bob Hope, William Holden, Frank Sinatra, Ann Sheridan and many others. 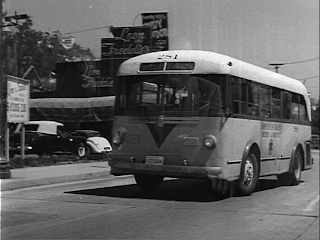 Part of the appeal of Toluca Lake is the small town village feel. The primary commercial street in Toluca Lake, Riverside Drive, is like an Eisenhower era main street filled with little shops. The quiet tree lined residential streets look like they belong somewhere in Middle America, not minutes from the energy of Hollywood. "Toluca Lake. I was born and raised as 3rd generation in our house. Born in 56' and resided there til 81. Grandparents, Babe and Shemp Howard bought this home at 4604 Placidia Ave. My grandpa was Shemp, the original of the Three Stooges. Our home was on the corner of Placidia and Sara St. They lived there from the 40's -mid 50's. They had chickens, a Victory Garden. My grandfather owned a gun only to use on pesty Gophers that would steel all the carrots. My dad bought the home shortly before I was born. We didn't have air conditioning nor a pool for many years. Shemp Howard's home at 4604 Placidia Ave. I recall the fwy being put in. Stayed cool by sprinklers, Water Wiggles, Slip and Slides. All the kids played together. Boys and girls, roller skating, riding bikes, having flour fights. We walked the back wall to get to friends houses regardless of being scratched or cut up by brush and bushes. Toluca Lake kids on Saturdays would spend much time on Riverside Dr. at Pop and Cork for a 'BigStick Popsicle then to The Five and Dime to play with all the open tables of toys. We'd walk through the T.L. Pharmacy where we were not allowed to touch anything. The T.L. Market where you could actually pick up the phone and order your groceries and have them delivered. Bob's Big Boy's car hops to see rollerskating waitresses. Patys for the big Pineapple and Marshmallow syrup. The Pancake House syrups. The Little Green Store on Camarillo. It was safe! Neighborhoods of Walnuts, Birch and Magnolias. 4604 Placidia Avenue, Toluca Lake, CA. The Rock on our lawn was the meeting spot for the kids. A mom would call and the friend would run home. I listened for the St. Charles Church bells at 6:00pm. T. Lake. Safe, quaint and well kept neighborhoods. Jill and I both had our weddings in our backyard. Doors of the house were only locked by Skeleton Keys. We had many varieties of fruit trees from Satsuma Plums to Kumquats. At 23, mom leased the house to Denzel Washington then sold it to him. I was crushed not to have an affiliation to that neighborhood anymore. 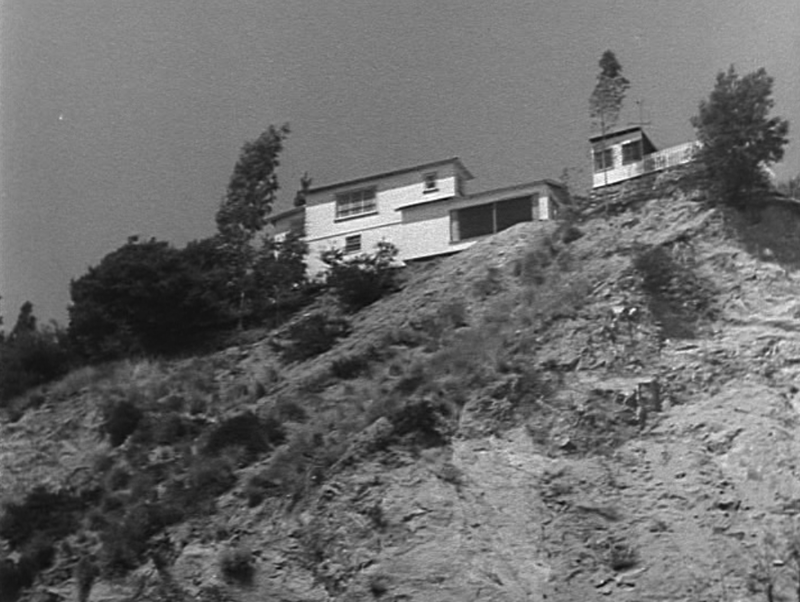 I honestly thought someone in the family would be in that house, in Toluca Lake forever. I make a point to drive through the neighborhood still. I want to go inside to see my house but I don't have the nerve - yet. Toluca Lake is still quaint today. Still close with a couple of kids from the blocks. Many of businesses are still thriving. If you can raise a family in T.L. you are blessed." 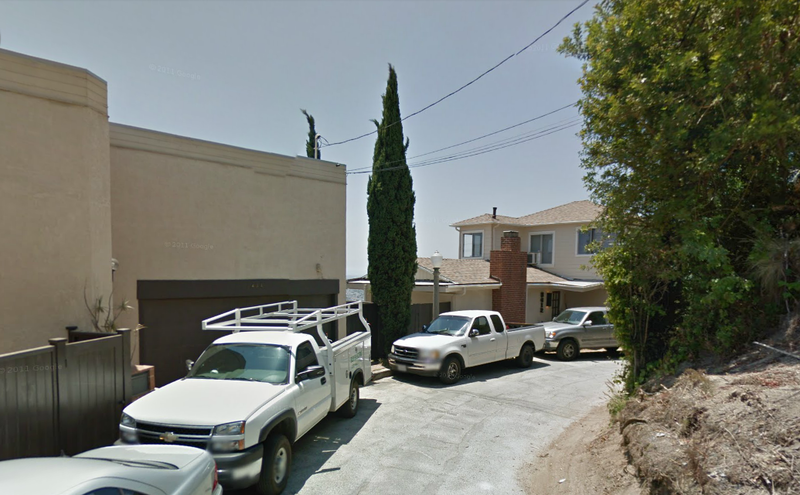 10522 Riverside Drive, Toluca Lake, CA. 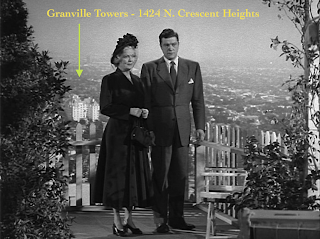 In addition to the home at 4604 Placidia Avenue, Shemp Howard also lived with his wife Gertrude in an apartment building at 10522 Riverside Drive. According to findadeath.com Shemp was living at this address at the time of his death. 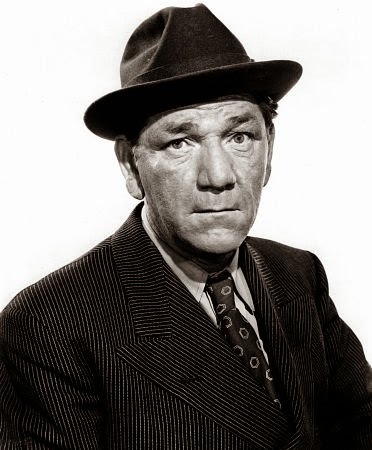 On November 22, 1955 Shemp had a heart attack on his way home from the fights. 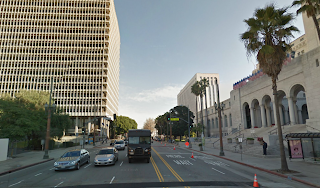 He died later on the way to St. Josephs Medical Center in Burbank. He was just 60 years old. I was once told that this apartment building, just like the house on Placidia Ave. was also later owned by actor Denzel Washington.